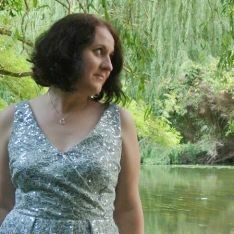 Hi I'm Joanne and I blog at sew little time. Thanks for having me on the Network! For my first Minerva Crafts Blogger Network garment I decided to work with my Autumn Winter wardrobe plans. As part of my long term goal to build an entirely me made wardrobe, I had planned to make quite a few separates this season. I've made Megan Nielsen's Kelly skirt before (but never blogged - must get onto that!) It's a great pattern for both summer and winter as it works with so many fabrics. When I was planning this I was looking for fabric with a bit of body as it really helps to keep the shape of the skirt and the pleats. I chose a cotton drill fabric from Minerva as it was a perfect weight and colour - the cotton drill comes in loads of other colours too but I wanted to stick to my winter colour palette. Of course by the power of Twitter I could check with Megan herself and Vicki from Minerva that it would work well. When it arrived I was really happy with the weight and sheeny texture of the fabric - much nicer than the twill I used before. I also got some perfect woven interfacing which has spoiled me for the cheap stuff I normally use! It's a woven interfacing that fuses really easily without wrinkling or stretching. Perfect for keeping the wide waistband of this skirt in shape. The skirt is really easy and quick to put together, especially since i had made it before. It would be a great beginner project or for someone who wants to practice buttonholes. I made a medium and lengthened by a couple of inches so that i could keep the nice deep hem. Even the buttonholes came out well! I sewed the buttons on with my machine - if you have a button foot I highly recommend getting to grips with it as it's so easy! My el cheapo machine came with one so it's likely lots of others do too. As I have terrible indecision when it comes to buttons, I was happy to get help from Vicki at Minerva. She helped me pick some great navy ones with a slight texture to them which look great. If you make this version of the Kelly skirt you can buy everything you need from my materials list with the burgundy twill, fab interfacing, buttons and matching thread from Minerva Crafts.